It is National Soil Conservation Week this week, so I thought it would be a good opportunity to look at the impact of erosion on soils in Ontario over the past few months. Throughout the middle of April we’ve had some intense rain events. We had a mild winter this year in southwestern Ontario, with little snow cover, and had some very windy days. In some cases, water carried soil away (Figures 1 & 2). In other cases, wind whipped it up and carried soil off of fields (Figure 3). Very soon the 2017 growing season will begin and these soil losses will be forgotten. But what was the impact of the soil that moved? 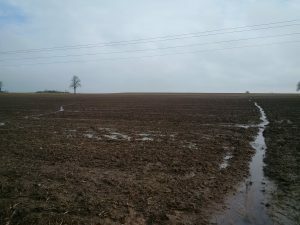 What is the cost of the lost soil and fertility? Figure 1. A long slope on a field near Port Colborne, Ontario in late January. 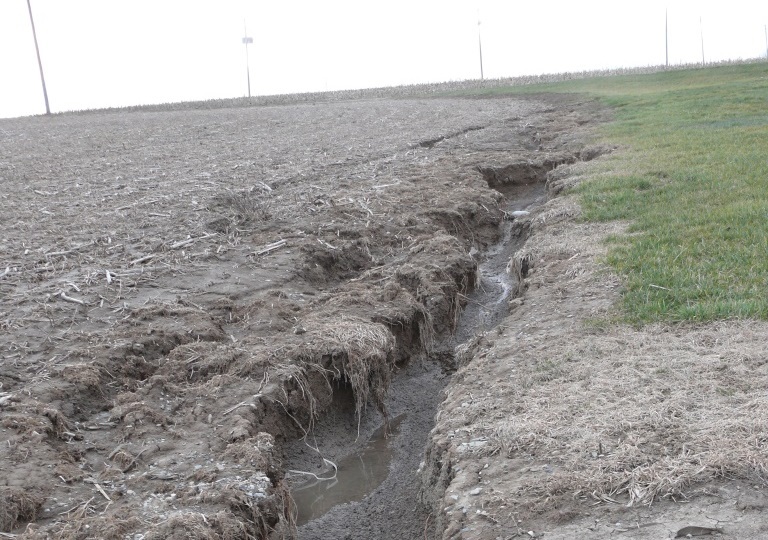 With minimal residue cover, water picked up momentum and eroded soil along the entire length. Figure 2. 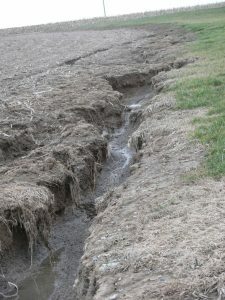 Gully erosion on heavy clay soil in Haldimand county, April 2017. How much soil has been carried away? Figure 3. Wind-blown topsoil on snow in Perth county, March 2017. Was this soil lost from a bare field or one with residue or plant cover? 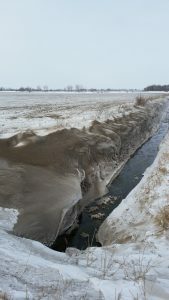 During a very windy day in early March, topsoil in Kent county was blown into ditches to a depth of 1 to 3 feet in some locations (Figure 4). Figure 4. What fertility has been lost from the field due to this wind erosion? Kent county, March 8, 2017. Photo: Colin Little, Lower Thames Valley Conservation Authority. *Measured using the Walkley-Black method. 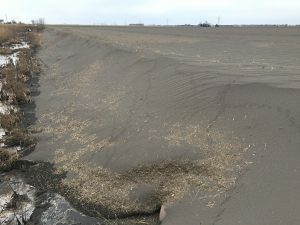 In a part of the province where average soil organic matter levels are around 3.5%, this wind-blown soil was clearly coming from the most fertile portion of the soil – the soil surface. To borrow from Peter Johnson’s “Wheat Pete’s Word”, if we assume a land value of $20,000 per acre, each pound of topsoil is worth 1 cent (based on 2 million pounds of soil in the top six inches). If the thickness of a couple pieces of paper is lost from a field, it represents one tonne per acre, or $22, of soil loss. Of course, when the most fertile topsoil is lost, the value is even greater. 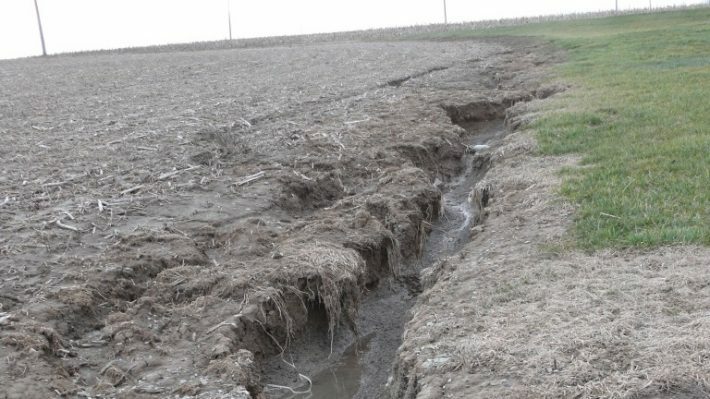 Given the impact of organic matter, phosphorus and potassium on yield potential, soil erosion can be costly. Fortunately, there are well proven solutions to minimize soil erosion. Here are examples of a few. Figure 5. 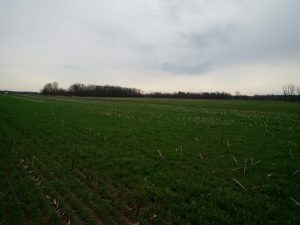 Overwintering cover crops, such as cereal rye, can be very effective in holding soil in place, even under very intense rain. This rye, planted after sweet corn, has held soil on an erodible slope. Photo: Michael Funk, Upper Thames Region Conservation Authority. March, 2017. Figure 6. Cereal rye cover crop in Brant county, mid-April, 2017. Seeded after corn silage harvest to protect soil from water erosion that is typical on this field. It has done its job. Figure 7. Fall strip till zones after corn harvest, Oxford county. 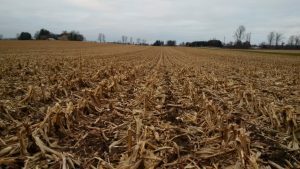 Strip tillage can help reduce erosion risk by maintaining residue cover. It also allows for incorporation and placement of dry fertilizer. Figure 8. 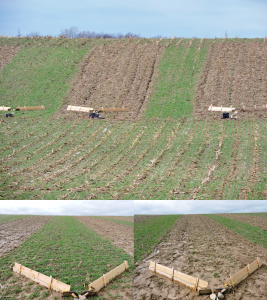 Grassed waterways can also be an effective method for minimizing water erosion in some fields. (Source: Jane Thomas, Integration and Application Network, University of Maryland Center for Environmental Science, ian.umces.edu/imagelibrary/). When soil is unprotected it can easily be lost, as we’ve seen this winter and spring. 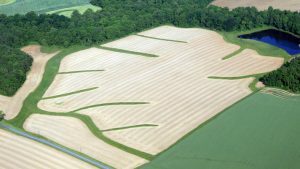 And all losses have a soil fertility impact – in some cases, it is greater than we might think. 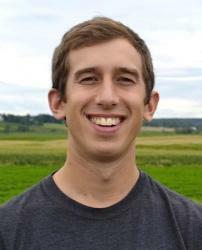 Cost-share opportunities, such as the Canadian Agricultural Partnership, can help you get started to put practices in place to minimize erosion – and fertility losses – from your fields.